Many cultivated plants can trace their roots to common roadside wildflowers and shrubs. Often gardeners often assume that the wild or native form is simply an escapee from someone's garden. These wildings are frequently overlooked and deserve more attention than they get. They're tough, hard to kill and come with the added benefit of being attractive to bees, butterflies and wildlife. One of the first plants to wrap itself in an autumn cloak is sumac. These small, shrubby, tree-like plants are often considered weeds and undesirable, but they can offer some of the most wonderful fall color to ever grace a garden. They're great for stabilizing slopes and make a good informal hedge if planted in groups. When the plants are in bloom hundreds of insects from butterflies and bees, to pollen eating beetles converge upon the pretty, upright blooms to partake in their goodness. Sumac of any species is an excellent choice for a wildlife garden. 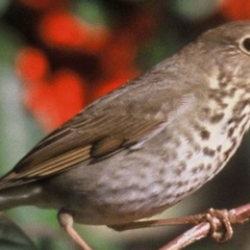 Songbirds love the berries and are often seen picking through the clusters in the dead of winter. Sumac is most often found in shaggy fence rows and at the edges of hardwood forests since the seeds are often spread by birds. The slender trunks frequently grow in grotesque shapes and unusual forms, which tends to frustrate gardeners who prefer military precision, but those of us who embrace the unusual are quite pleased with their quirky forms. The compound leaves often grow between 12' and 18" and droop from the stems in an attractive manner. Generally unnoticed through most of the season, sumac doesn't stand out from the crowd until autumn arrives. Seemingly overnight, the green leaves change to a startling crimson that seems to glow with an inner light. Those of us lucky enough to have it growing wild find it a lovely bright spot in a rapidly changing landscape. I love watching for it in late summer along the roadways. The sumac used in the header of this article is Shining Sumac, or winged sumac, Rhus copallina. It is one of the most common sumacs in the eastern US and can grow to about 30' tall in ideal conditions, although much smaller specimens are more common. They are easy to prune to smaller shapes if you need to control their size though. 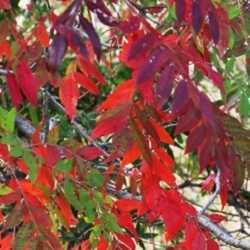 Here in western Kentucky, we also have smooth sumac, Rhus glabra and staghorn sumac, Rhus typhina. All are small tree-like shrubs that boast some vivid autumn colors. Used by Native Americans in a number of ways, sumac was an important part of their lives. They crushed the berries to make a tart drink that was similar to lemonade and the bark was used in tanning hides, while the roots produced a lovely yellow dye. It was also a part of their herbal pharmacy and they used parts of this plant to treat various ailments from ringworm and hemorrhoids to bleeding gums. 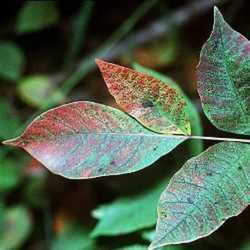 The leaves were also gathered in the fall once they changed to red to be mixed with their tobacco as a flavoring. The only sumac to be wary of is poison sumac, Toxicodendron vernix which can be identified by its white berries and its love for wet and boggy conditions. Not to be confused with the white or cream colored flowers of the shining sumac that is pictured below. Some species of sumac were used in place of lemons in parts of Europe and the Middle East. The berries were soaked in water, crushed and strained to produce a tart flavoring favored in many recipes. There are 35 species of sumac world-wide and this relative of the cashew (Anacardiaceae) is a familiar plant in the herbal lore of many cultures. Sumac isn't picky about soil or fertilizer. In fact, it seems to prefer waste areas and sandy clay. It is drought tolerant and somewhat resistant to deer and rabbits. It grows well in full sun to part shade and about the only thing it doesn't like is wet feet. Sumac laughs at harsh conditions and few pests bother it. It is an excellent understory plant for the edges of a woodland garden because it tends to have thin branches and unusual shapes anyway. Planted alongside more robust trees like oaks and maples, it adds to the texture of a garden without overpowering the landscape. It can get a little weedy with unwanted seedlings, so if you find more than you want popping up, just snip the berry bunches before they mature. It is a trade-off with the birds and in my experience, they generally clean up most of the seeds without any help from me, leaving only a few wayward seedlings to sprout each spring. I leave the seed pods for them and they keep my insect population in check. Several commercial sources offer various Rhus species and there are even some cultivated varieties available. The autumn color is unparalleled and these tough plants require little care. A win-win situation in my book. I come from a long line of Kentuckians who love the Good Earth. I love to learn about every living thing, and love to share what I've learned. Photography is one of my passions, and all of the images in my articles are my own, except where credited.